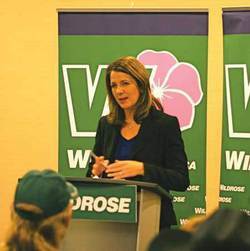 Wildrose leader Danielle Smith stopped in Leduc to speak to constituents and Interested parties at the Four Points Sheraton in Nisku on Thursday Nov. 14th. She spoke about some of the parties basic policies and also took questions from the audience. Photo by Lorna Lowe.